Who has this good health insurance? Angrier and angrier I get. Isn’t it patently clear that the insurance companies need to be eliminated? How in the world has the Republican party convinced American people to argue on the behalf of the very companies that turn down our claims, cancel our health plans, and overcharge us for the privilege? And another thing? Why aren’t we going after the pharmaceutical companies? Yesterday I received 36 boxes (72 doses) of generic Imitrex (sumitriptan succinate) at a cost of $5,200 (not my cost – what the drug costs). That is $72 per dose; for generic. There has got to be the understanding that controlling costs in the healthcare industry without reigning in the pharmaceutical industry is like losing weight while maintaing that Cheesecake Factor diet. Of course when your Chief of Staff is in the pocket of the pharmas. Today I couldn’t avoid the right-wing assholes. 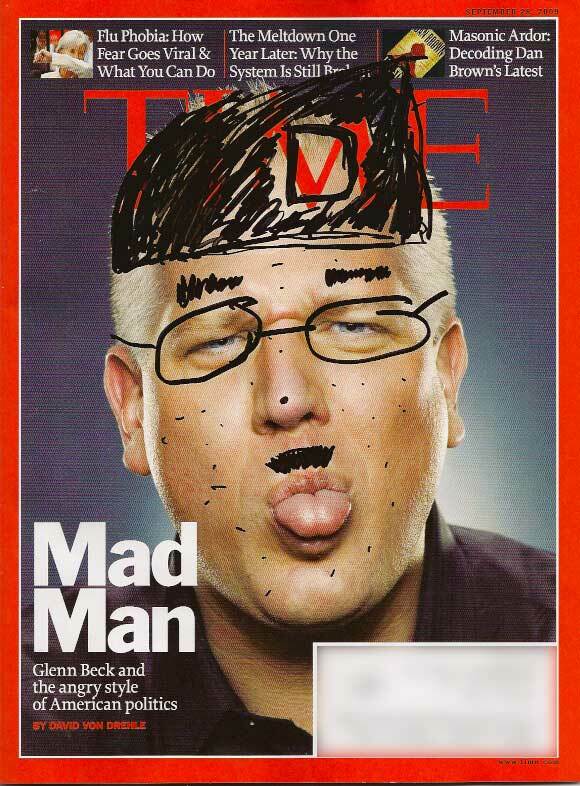 The Phillies happen to be on the same radio station as Limbaugh, so when I got in my car this morning who else but Limbaugh blaring his fascist drivel; quick switch to the iPod. 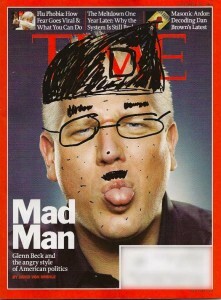 Then when I returned home, I checked the mail and who’s on the front of Time but Glenn Beck. Quick use of a Sharpie saved the day. Much improved, don’t you think?